Burgers, chicken, pizza or pies - which are the fast-foods that South Africans prefer? 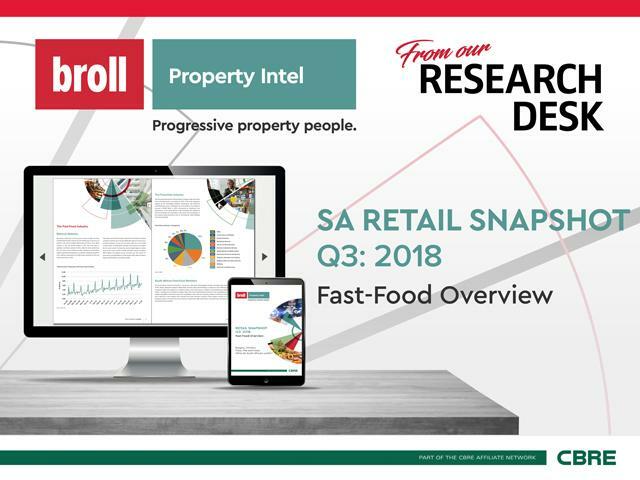 In order to determine which fast-food category performs best, Broll Property Intel's Retail Snapshot Q3:2018 investigates the fast-food industry in South Africa; assessing the trading densities (TD) of a wide range of fast-food retailers across various shopping centres, over a 5 year period. The resultant findings highlight the importance for retailers to receive the best information regarding their location, target market, demographics, etc. In terms of the country's Food and Beverage Industry, year-on-year (y-o-y) growth slowed to 0.1% as at July 2018. More specifically, restaurants and coffee shops experienced a y-o-y decline of 1.6%, catering services declined by 1.6%, while Takeaway and Fast-Food outlets experienced the highest y-o-y growth, achieving a growth of 2.8% and have been recording a positive trend line since January 2008 with regards to total income recorded. When it comes to the franchise industry, the Fast-Food and Restaurant sector plays a prominent role, contributing the most (29%) to the industry's turnover of R587 billion in 2017. In the South African retail landscape, the majority of Fast-Food retailers are franchisees, with some of the key players in the industry being franchisors such as Yum! Brands, Taste Holdings and Famous Brands. The entrance of a number of new brands into the South African Fast-Food industry in recent years has expanded the offering to consumers, as well retailer competition. Even though an increasing number of drive-thru's have become evident over recent years, fast-food deliveries have now also become the norm. Mr D Food and UberEATS are said to hold a 90% market share when it comes to the fast-food delivery market. Mobile apps and online systems now allow for fast and effective order placing, without having to spell out your name, surname and street address countless times. When looking at various Broll managed shopping centres over a 5 year period, average TD for fast-food overall have been experiencing a slight declining trend, which can be attributed to the increased financial pressure which consumers are under due to increasing price hikes. Most fast-food categories achieved TD in line with or above the market average, barring Fish and Other. In the first three years, Pizza was the top achiever but in year 4 it was marginally overtaken by Burgers, with Pies as the best performer in year 5. This is possibly an indication of consumers making more affordable fast-food selections. top choice, while burgers are preferred in smaller centres. When looking at locational parameters, Burgers are the top achievers in main cities and Pies for outer-lying areas. When comparing the three major provinces, average TD in 12 months to August 2018 were the highest in Gauteng for Burgers, Chicken and Fish, the Western Cape recorded the highest TD for Pies, while Pizza came out on top in KwaZulu-Natal. Lastly, when looking at international versus local retailers, in terms of Burgers, Chicken and Pizza, local retailers achieve higher TD with regards to Pizza. Broll's Retail Snapshot Q3:2018 highlights the fact that the best performing fast-food category differs depending on the various parameters that can influence a business's success, such as the centre size, it's location, etc. Hence, the sector-specific information that Broll Property Intel offers is of vital importance for both landlords and occupiers as they become aware of their target market, information about their location, the surrounding demographics, existing competition and more in-depth information, which all has an impact on their business. To download the full SA Retail Snapshot Q3:2018 report click here.